A full colour book containing 155 vintage and 47 new stereographs of Margate, with descriptive text. The stereographs have been prepared as overlapping red and green images (anaglyphs) which give a stereoscopic 3D effect when viewed through the red/green glasses included with the book. 76 pages A4 size spiral bound. Stereo glasses provided. Cost: £14.50 including Postage & Packing. (UK Price). 'Margate before Sea Bathing' is available in an on-line version here, or as a paperback from Amazon.co.uk at £14.64. Margate was to become one of the first English seaside resorts, but it had been little more than a fishing village before the pleasures of sea bathing became popular in the early eighteenth century. 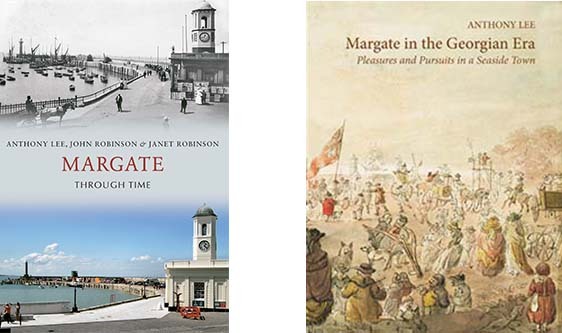 This book uses a wide range of original documents to describe the early history of Margate, to show what life was like in Margate at the time, and to show how the foundations were laid for the town’s future importance. . The menu on the left provides access to a number of zoomable maps of Margate from 1717 to 1954. Further details are provided at Margate Maps, or for iPAD users iPAD Margate Maps. Click on a coloured spot to see pictures. 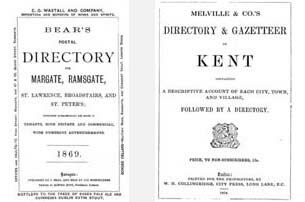 The menu on the left provides access to a number of Margate directories from 1791 to 1883 in PDF format. Further details are provided at Margate Directories. Photographs can be accessed from "Maps with Pictures" on the menu on the left. Many prints of Margate can be accessed from "Margate Prints" on the menu on the left. Under "Maps with Pictures" on the left, see the trams and tram line from Westbrook to Northdown. Click on a coloured spot to see the trams at that location. 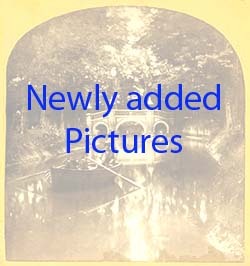 Pictures newly added to the site can be accessed from the menu on the left or from here Newly Added Pictures. Margate was one of the first English seaside resorts. From the 1730s it set out to attract visitors, particularly from London, who came by coach and sailing ship to take advantage of the fine sandy beaches and healthy air. Fashionable squares and terraces overlooking the sea were built to house the visitors and much of this Georgian and Victorian heritage remains, and is illustrated in this book. The book starts with a pictorial description of Old Margate, based on a walk described in 'The Steam Boat Companion' published in 1834. The two following chapters describe the expansion of the town westward to Westbrook and eastward to Cliftonville. The pairs of old and new pictures show a town with a long history making a new future for itself. 96 pp, full colour. Newly published by Amberley Press at £14.99. Available from local bookshops and on line from Amazon etc. During the Georgian era, from 1714 to 1830, the town of Margate was transformed from a small run-down fishing village into one of the first sea-side resorts. This 212 page large-format book with 150 full coloured illustrations tells the story of this transformation, in maps, pictures, caricatures and prints of the time. It describes the importance of the Margate hoys and the early steam ships in providing cheap and ready access from London. It describes the typical visitor to Margate, how these early visitors would bathe in the sea, and the hotels, assembly rooms and libraries built for their amusement. The book will be of interest to those wanting to explore the development of the English holiday, as well, of course, to those with a particular interest in the county of Kent and the town of Margate. 212 pages, 8.5ins x 11ins, 150 illustrations in full colour, with full-colour stiff card cover. 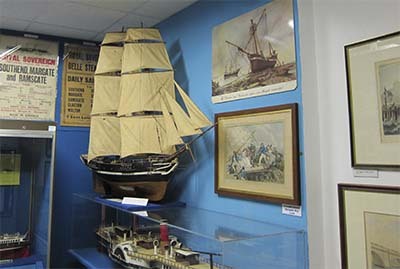 Margate Museum Web Page for opening times etc. Joshua Waddington was a major figure in Margate in the first half of the nineteenth century. He was one of those responsible for bringing an end to the rule of the town by the Cobbs and by the self-elected Board of Improvement Commissioners and was important in the introduction of a more democratic system of government, first with a Local Board of Health and then with a Town Council. Joshua Waddington, a rich local doctor and a self-proclaimed Tory, seems an unlikely figure to align himself with the radicals of Margate. However, his father Samuel Ferrand Waddington, a wealthy London merchant, was an associate of many famous radicals fighting for democratic reform. Samuel Ferrand Waddington was a complex character, a hard-headed business man as well as an active radical. In 1801 he had been found guilty of trying to rig the market in hops, and was imprisoned in the King’s Bench prison for 27 weeks, where he met the charismatic radical speaker Henry Hunt. Hunt described Samuel Ferrand Waddington as ‘a decided opposition man’ and both father and son took obvious pleasure in opposing those in power. Understanding the political life of Samuel Ferrand Waddington gives us some insight into why his son Joshua chose to involve himself so deeply in the politics of Margate. The life of Samuel Ferrand Waddington is described in the article Waddington father and son that can be accessed from the drop-down menu on the left (Margate Articles/Waddington father and son). An article, Margate Crime and Margate Punishment, has been added to the site and can be accessed from the drop-down menu on the left (Margate Articles/Margate Crime). A study of Margate crime gives us an insight into the lives of the poor of Margate and their struggle for survival, as reported in the court records and newspapers of the time. Margate was a ‘limb’ or administrative part of the port and town of Dover and under this arrangement, Dover was responsible for the implementation of law in Margate. This was a constant irritant to the town and even after receiving its Charter of Independence, the complexities of the Cinque Port System were such that the inhabitants of Margate were sent to Dover for trial and were imprisoned in Dover gaol. Early town directories generally do not include addresses. Surveys of land and properties made for rating purposes do, however, contain names of the owners of property, and, in some cases, these owners will also be the occupiers of the property. A survey of the property in Margate was made in 1801 and a copy of the survey was printed. It seems likely that all copies of the printed survey have now been lost, but a manuscript copy was made by Jane Edwards, with notes by Arthur Walton Rowe; this manuscript is in Margate Library Local History Collection. This I have now transcribed and made into a web-searchable version. It can be seen from the ‘Directories’ menu on the left or from the link Margate Valuations 1801. In the days before photography, the cinema, television and the web, when newspapers contained no pictures, and there were no holiday brochures, how were holiday makers going to decide which sea-side town to visit for their annual holidays? At the end of the eighteenth century and start of the nineteenth, the citizens of London could see pictures of Margate at the Panorama in Leicester Square, and in a number of theatrical productions, including Summer Amusements, or an Adventure at Margate, at the Haymarket, and in pantomimes at Covent Garden and other theatres. 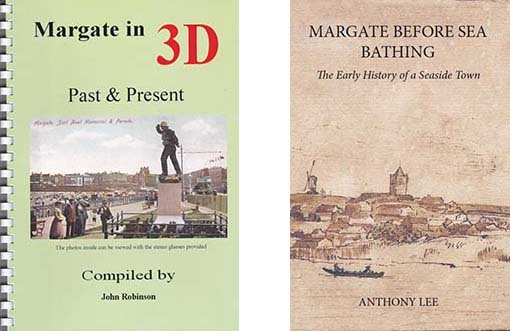 These are described in a new article, Representations of Margate in Early London Shows. 13 October 2013. An article has been added describing the destruction of the old Royal Hotel and Assembly Rooms at Margate by fire in 1882, the subsequent rebuilding of the Assembly Rooms, their conversion into the Grand Theatre and their eventual renaming as the Hippodrome. The article can be accessed from the left hand menu (Margate Articles) or from here: Margate Assembly Room Fire. 18 August 2013. Thanks to Janet Robinson for an article on the Jarvis Family in Birchington and Margate, including, of course, Dr. Daniel Jarvis, responsible for 'Jarvis's Landing Place'. The article can be accessed from the left hand menu (Margate Articles) or from here: The Jarvis Family of Birchington and Margate. 17 July 2013. A better version of Arthur Rowe’s map of the lower High Street in 1840 has been added, courtesy of James Brazier. It can be accessed from the left hand menus, or from here: Margate Lower High Street 1840. 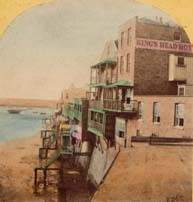 An article on the Margate Local Board of Health 1851-1858 has also been added. 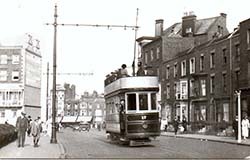 This was a very important period in Margate’s history, bridging the gap between the period of rule by the old, self-selected, Town Improvement Commissioners and the more democratic rule by the Margate Town Council, appointed when Margate was given Borough status in 1857. During their period of rule, the Margate Local Board demolished the slums of Pump Lane and Jumble Joss Island, built a new road to the Fort and secured the public walks on the Fort, built sea defences at Westbrook in conjunction with the development of the Royal Crescent, and were involved in the building of a new cemetery and a new Jetty. The final success of the Local Board was to plot its own demise, working actively to obtain a Charter of Incorporation for the town. The history of the Local Board can be accessed from the left hand menu (Margate Articles) or from here: Margate Local Board of Health. If, like me, you find reading large amounts of text from the screen rather tiring, there is a toggle switch ‘Reading Version’ at the top left of each article, and this switches the article into a clearer mode for reading. Pressing the toggle switch a second time reverts to the original view. The search facility has been updated to include recently-added pictures and the new articles. 28 February 2013. Articles have now been added describing the symbols and abbreviations on Ordnance Survey Maps (OS Map Symbols) and giving a brief history of the Ordnance Survey maps of Margate (OS Maps of Margate). 1 February 2013. Users of iPADs can now view the zoomable maps on this site. On the left hand menu click on 'iPAD Margate Maps with Pictures' or 'iPAD Margate Maps', as appropriate. For the technically minded, the zoomable maps used the 'Zoomify' viewer that, in turn, used Flash, and Flash does not run on an iPAD. However, the latest version of the 'Zoomify' viewer uses HTML5, and that does run on an iPAD. Users of desktop and laptop computers can also use 'iPAD Margate Maps with Pictures' or 'iPAD Margate Maps' if they wish, and, if you have the latest versions of your web browser (such as Internet Explorer or Firefox), you may find the maps run more quickly. SEARCH: The search facility has been improved and updated. It should now be possible to use 'Search' to locate all text and illustrations on the site. 24 October 2012. High resolution 1852 Map of Margate. 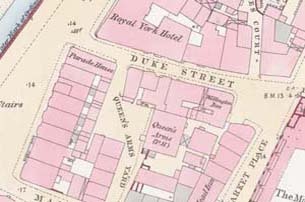 By kind permission of Margate Museum, an 1852 map of Margate has been added to the site. The town was surveyed in 1852 by the Ordnance Surevy Department in accordance with the Provisions of the Public Health Act; the map was printed by lithography, in twelve sheets. The map can be accessed from here: Margate Map of 1852 , or from the drop down menus on the left. The map will be populated with pictures over the next few weeks. A brief history of the map will also be added, together with an explanation of the symbols and colours used on these early Ordnance Survey maps. 11 April 2012. A new button has been added to the menu on the left, "Dreamland", showing pictures of Dreamland and the Hall-by-the-Sea. 24 March 2012. A new section on Margate Storms has been added to the menu on the left, showing prints and photographs of the many storms that have hit Margate over the years. Under "Margate Maps with Pictures" on the left, click to see the trams and tram line from Westbrook to Clftonville in 1907 and from Cliftonville to Northdown in 1936, after the major redevelopments in the Cliftonville area. As always, click on a coloured spot to see the trams at that location. The pictures are mostly from the collection of the late Mick Twyman, courtesy of Eve Twyman, and I thank John Robinson for scanning them. 8 February 2012. Margate Maps with Pictures. Ordnance Survey Maps for Margate for 1907 (scale: 25 ins/mile) have been added to the site, linked to ca 2000 Post Cards and other illustrations of Margate for this period. This still leaves a number of streets and buildings in Margate un-illustrated and I would be very grateful for any further illustrations that could be included with the maps. My contact details are given under 'Contact' on the top menu. 4 December 2011. A number of new prints and stereos have been added to the Edmunds map of 1821 and the 10ft/mile Ordnance Survey Map of 1873. Also a new "Margate Families" section has been added that includes a fascinating history of the Stannard family in Margate, very kindly provided by Virginia Silvester. 19 June 2011. Pictures have been added to the Edmunds Map of 1821. Clicking on one of the coloured spots now opens a Gallery Viewer showing relevant pictures. The use of the Gallery viewer is described in detail under "Help." FOR USERS OF FIREFOX . The Gallery Viewer works best if Firefox opens the Gallery Viewer in a New Window rather than in a New Tab. The default setting of Firefox is to open a New Tab. This can be changed in Firefox/Options/Tabs, by unclicking the first option "Open new windows in a new tab instead". 12 June 2011. The selection of Prints has now been completed with the addition of a number of Margate Caricatures and a number of Margate People. On a more technical note, a Search facility has been added: it is now possible to search the whole contents of the site, or to search separately text, pictures, and PDF files. Finally, a more convenient picture viewer has been included for viewing the smaller pictures: clicking on the small thumbnail picture opens up the viewer; click and drag on the picture to move it around the screen; click on the cross symbol on the bottom right to expand the picture to full size; click on the picture or on the cross symbol at the top right to close the picture (as you move your mouse across a picture these instructions appear, so there is no need to remember them). 30 April 2011. 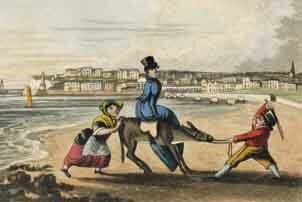 Further prints have been added to the site: Margate Prints from Local Publishers, Margate Prints from London Publishers, the rather odd Leporello Albums popular at the end of the 19th century, the woodcuts from Bonner's book, and the plates from Oulton's book, "Picture of Margate." These can all be accessed from the "Margate Prints" list in the left hand vertical menu. I would be very pleased to hear from others with prints of Margate not yet included on the site, so that we can make the site as comprehensive as possible. My contact details are given under "Contact" in the horizontal banner menu at the top of the page. 8 April 2011. A history of Margate prints has been added to the site, together with a set of about 120 steel line-engraved vignettes. These can be accessed from the drop-down menu on the left. Other prints of Margate will be added in the near future. 20 March 2011. Three further Ordnance Survey Maps for Central Margate have been added; 25 in/mile maps for 1906 and 1936 and a 50 in/mile map for 1954. 21 Feb. 2011. James Brazier of the Margate Civic Society has provided some fascinating information about the two sketch maps, '1821 Edmunds Map: Detail' and '1840: Lower High Street, Margate' which is now included on the 'Further Details' Map page. 13 Feb. 2011. Three new Margate Maps have been added; Harris’s Map of 1717, Andrews’s Map of 1769 and Bacon’s Large Scale Plan of Margate of ca. 1896.